Continuous glucose monitoring may or may not be something that you’re familiar with. It’s a technology that has revolutionized diabetes self-management, and like all technologies, it’s quickly evolving. Traditionally, continuous glucose monitoring, or CGM, has been marketed for people with Type 1 diabetes, but the tides are slowly turning, and more and more people with Type 2 diabetes are using it, as well. One of the newest CGM systems to hit the market is the Dexcom G6. I had the opportunity to speak with Kevin Sayer, the President and Chief Executive Officer of Dexcom, as well as Ryan Lazarus, a person with Type 1 diabetes and an avid proponent of the Dexcom G6. Continuous glucose monitoring (CGM) automatically measures and tracks real-time glucose levels throughout the day and night. It works through a tiny sensor that you insert under your skin, typically on your stomach. The sensor measures glucose in interstitial fluid, which is the fluid between cells. The sensor measures glucose every few minutes, and a transmitter wirelessly sends the information to a monitor, a smartphone, or even a smart watch. A CGM device can also detect if your glucose is going too high or too low, and alert you so that you can take appropriate action. 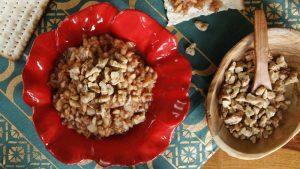 • You’ll get glucose readings every 5 minutes, or up to 288 readings in a 24-hour period. Even frequently checking your blood sugar with your meter can’t possibly give you the data that you get from CGM. Plus, CGM lets you know what’s going on with your diabetes at times when you may be unable to realistically check your blood sugar, such as while you’re in a meeting, playing sports, or sleeping. • Research shows that using CGM can reduce A1C levels. In one study, people with Type 1 diabetes who used CGM reduced their A1C an average of 1.3 percent. • CGM can reduce the frequency of hypoglycemia, or low blood sugar. • Because newer CGM systems are integrated with smartphones, parents can more easily monitor their child’s glucose levels at any time of day or night. • You and your health-care team can more quickly and easily make changes, as needed, to your diabetes treatment plan when you use CGM. In fact, the Dexcom G6 CGM is the first FDA-approved device to make diabetes treatment decisions without having to calibrate (meaning, no fingersticks!). 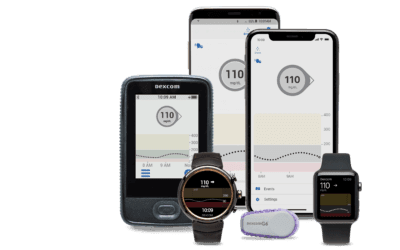 While there are several CGM systems on the market, Dexcom has been the leader of the pack for many years now, and it’s easy to see why: the company doesn’t rest on its laurels. Instead, Dexcom is constantly advancing its technology to provide new and improved features. For example, their G5 system’s transmitter was their first CGM to work using a Bluetooth signal that could be picked up by a smartphone rather than a receiver. • No more fingerstick calibration — but the same level of accuracy. • A simpler inserter with a rounded push button that inserts the sensor beneath the skin. And, you don’t even see the needle. • The sensor can be worn for 10 days, which is 43 percent longer than previous versions of Dexcom sensors that are approved for 7-day wear. •	The sensor has a slimmer profile on the body, which means less bulk. Let’s look at someone who is using the Dexcom G6. Ryan Lazarus suffered a sports injury at the age of 18, requiring the removal of most of his pancreas, along with his spleen. His world was turned upside down when he was diagnosed with Type 1 diabetes five years later. Ryan relayed how difficult it was to stay “compliant” with constant blood sugar checks. He was introduced to Dexcom about four years ago and proclaims, “It was instantly a game changer. Now I had data — I could literally see a graph of what I was doing.” Ryan started using the Dexcom G6 system a few weeks ago and, not surprisingly, can’t say enough good things about it. While he occasionally checks his blood sugars with his meter, using CGM has given him “amazing freedom.” His A1C has dropped from 11 to 9 to 5 percent, and CGM use has enabled him to keep his glucose readings at about 100. Is CGM for those with Type 2 diabetes? CGM is a marvelous technology for people who have diabetes. But using CGM comes with some caveats: first, while it’s fairly straightforward and simple to use, it requires time and effort. Depending on the system that you choose, you may still need to do some fingersticks with a conventional meter. Also, CGM doesn’t come cheap. In general, health insurance is more likely to pick up the tab for CGM for someone who has Type 1 diabetes. The good news is that more and more people who have Type 2 diabetes are getting coverage. You’re more likely to get insurance coverage if you have high blood sugar (based on several daily fingersticks and maybe an A1C), frequent episodes of low blood sugars, or hypoglycemia unawareness. If you’re gearing up to start CGM, remember that you’ll need a prescription, and you should either keep written logs of your blood sugar results or downloaded reports from your meter as evidence that you could benefit from CGM. Also, be prepared for a rejection. Stay the course and keep trying. Go through the appeals process. Last year Medicare began covering the Dexcom G5 system for people with Type 1 or Type 2 diabetes on intensive insulin therapy (see Dexcom’s website for the full list of criteria). Dexcom G6 is not yet covered by Medicare, but stay tuned, as that could change. Dexcom is committed to CGM access for people with Type 2 diabetes. Kevin Sayer shared that Dexcom has the “most robust pipeline in the market.” Future products must be accurate and perform to FDA standards (that’s a given), they must be convenient in terms of insertion and size, and they must be lower in cost. He adds that A1C levels don’t tell the whole story. And medications for Type 2 diabetes are expensive, so by using CGM, you and your provider can better determine how your medications are working and what needs to be changed. To learn more about the Dexcom G6, visit the company’s website. (Remember, too, that there are other CGM systems available, including those made by Medtronic and Abbott.) If you’re interested in CGM, do your homework. Talk with your provider and/or a certified diabetes educator to discuss pros and cons, and whether CGM is right for you.